Inspiring and interactiive keynote to learn how to use mindfulness for career success and reduce stress. 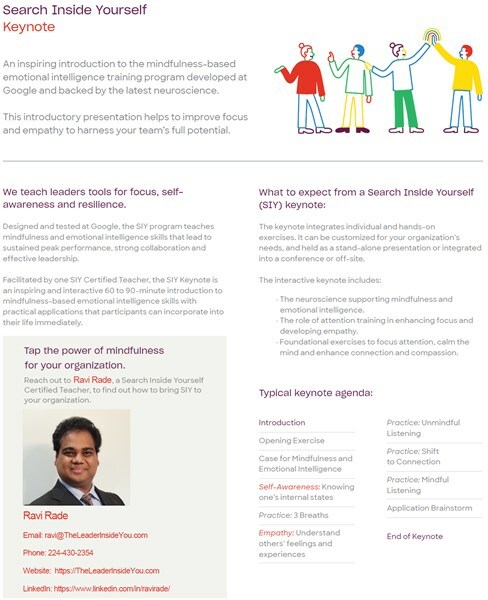 Search Inside Yourself : Mindfulness-based emotional intelligence training program developed at Google and backed by the latest neuroscience. An inspiring, interactive 60 to 90-minute keynote of the mindfulness-based emotional intelligence training program developed at Google and backed by the latest neuroscience. The Search Inside Yourself (SIY) Keynote includes: The role of attention training in enhancing focus and developing empathy. Foundational exercises to focus attention, calm the mind to reduce stress and enhance connection and compassion. Keynote gives practical applications that participants can incorporate into their life immediately. I am a certified Search Inside Yourself Teacher and a Certified Professional Co-Active Coach. I work with growth-hungry professionals and teams to maximize their success and reduce stress from their work and lives. My coaching and speeches reflect my 25 years of corporate leadership experience and knowledge from my MBA from Booth School of business, University Of Chicago. Benefits of the SIY program are building skills for sustained peak performance, strong collaboration, effective leadership and stress reduction. The keynote integrates individual and hands-on exercises. It can be customized for your organization's needs, and held as a stand-alone presentation or integrated into a conference or off-site. The neuroscience supporting mindfulness and emotional intelligence. The role of attention training in enhancing focus and developing empathy. WHY : Envision your future. See the path forward. Take Action. WHAT: You will create a vision for your future and get started on it with a strong force of commitment! HOW: Highly experiential online workshop followed by powerful one-on-one coaching by masterful Co-Active coaches. Sometimes we feel confident and sometimes we don't. Is there any way we can achieve everlasting confidence? Learn the technique and practice using the audio. How to overcome setbacks, failure. A 3-Step Process. A 7-step guide to becoming a lazy listener. How to calm your mind in just a few seconds, like writing on water? 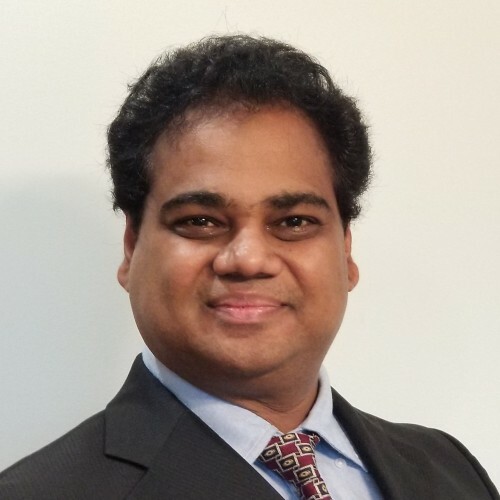 Find out more about Ravi Rade at https://www.theleaderinsideyou.com/.